The truth is, I don't own any swimwear. For a few years I just borrowed a swimming costume from my mum on the rare occasion that I was dragged into a swimming pool but, for a long time now, I haven't had to even borrow a swimming costume as any suggestion of me going swimming is vetoed point blank. It's not that I hate swimming. I used to love swimming - I felt like I should have been born a mermaid for much of my childhood. I just had no confidence in being in public wearing so little. I think the last time I wore a bikini was probably when I was about 9 - even then it was a tankini and I felt awfully self-conscious. But the last time I went swimming I wore a borrowed swimming costume, a large tshirt and a pair of knee length shorts. Thinking of that, I feel sad that I had so little confidence in my body that I had to wear more than most people were wearing outside of the pool let alone in it. But, this summer, I want to try to make a step in the right direction and at least buy a swimming costume. I find that it is difficult to find a nice swimming costume though. There are always so many different bikinis which are always so pretty and which I couldn't help including in my favourites here but there aren't so many options with swimming costumes. I would love to see loads of different styles and prints in swimming costumes and for them to be super flattering but that doesn't seem to be the case. 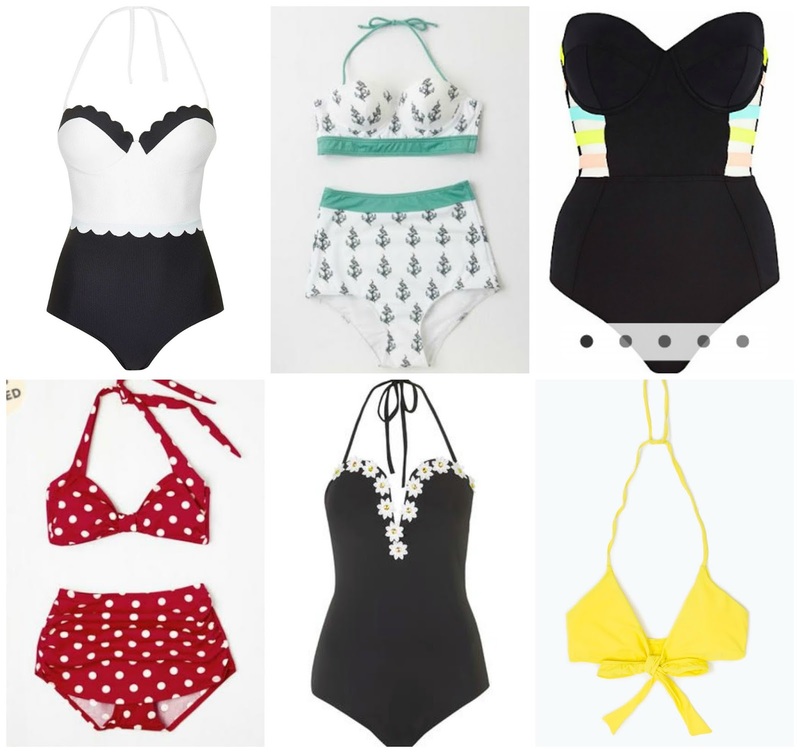 I do like though this current trend of high waisted bikinis as my stomach isn't my favourite area so I would feel a lot more comfortable if it was a bit covered and, also, I just think the style is so cute and retro. This Topshop swimsuit (no. 1) looks PERFECT! Love the daisy one, super cute! The first one is just too too cute. Love all of these, especially the first one - I might actually pick it up! oooh love them all, the one with daisies has to be my favourite! Eeee, I love them all!